With our February Into Dystopia boxes arriving all over the world and our March Under the Sea..boxes selling like hot cakes (make sure you buy yours now if you haven’t already! 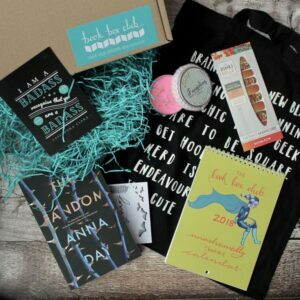 ), we thought it was high time that we showed you all of the lovely items that we included in our January Geeks Unite box! So without further delay, let’s get straight to the unboxing! Scrolled Invite – Meet the author of our featured read and your fellow unashamedly bookish Book Box Club members, as we chat to Anna Day about her brilliant book from the sanctuary of our cosy online Clubhouse. Brains are the New Black bag by Newton and the Apple – Lug your bookish tomes around in this stylish tote by gloriously geeky designers Newton and the Apple. Unashamedly Bookish Calendar by Book Box Club’s arty buddies – Created by the incredibly talented winners of our illustration competition, our exclusive calendar celebrates favourite reads and what it means to be unashamedly bookish in 2018. Keep track of your Book Box Club deliveries and reading goals and then cut out the prints and poster your wall like a true bookish groupie! As always, we would like to say a massive THANK YOU to all of the crafters, small businesses and illustrators who made this box as unashamedly nerdy as could be. 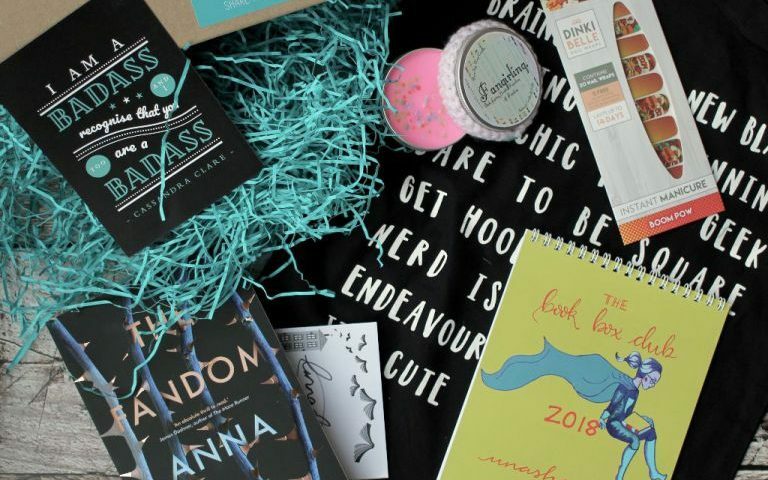 As self-confessed geeks, we were so happy to get to be able to unite unite with lots of other bookish people with our first box of 2018. We are always in awe of the creativity of our item suppliers so make sure you all go and check out their Etsy shops/social media places! We’d like to say an especially big thank you to all of the illustrators from our bookish calendar. It was such a thrill to be able to feature so many amazing artists in a single item, and the real bonus for us is, that we now have a list of twelve talented people who we can’t wait to work with on future box items. @georginemakes, @lkillustrations, @moon_kestrel, and @kristinaskland. We are also super excited for all of our January members to read Fandom, its such a brilliantly plotted page turner that is just crying out to be discussed at book group. Anna Day will be there to answer your questions too, so prepare to unleash your inner fangirl!